[David Losada, Ushahidi] dear Nesp, in order to access data contained in a deployment, I’d recommend to choose one of both options: either accessing the database or using the APIs. In general, all the information should be accessible through the APIs and that's probably a cleaner approach. A Heroku server should be fine for accessing the API, but in any case, if you want to have your own server and don’t intend to make modifications to the code, we’d recommend the zipped release bundle. That will probably also be easier to install on Windows (since you won’t need to setup node.js to build the frontend application). Make sure you are using PHP 5.5 or 5.6. Hope this helps! [David Losada, Ushahidi] Hi. if you are using Ushahidi 2.7 , do you mean this file https://github.com/ushahidi/Ushahidi_Web/blob/513bbc0c9f9afcfc37ffd94406e87f2f662fd32d/sql/ushahidi.sql ? I plan to install ushahidi locally, should I download that one you mentioned ? 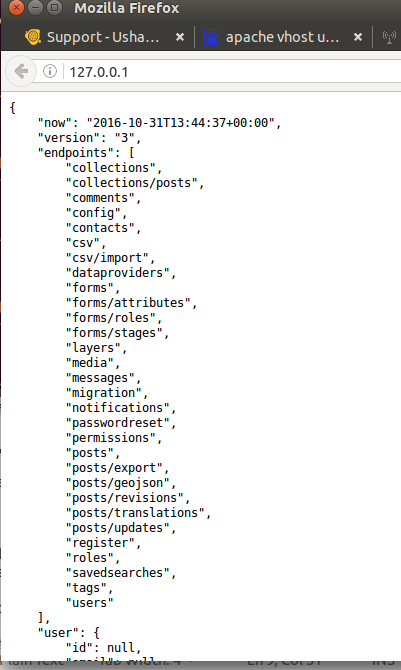 [David Losada, Ushahidi] did you create a file with your database settings? Now create a .env config file i? [David Losada, Ushahidi] what is holding you back? do you know your database server connection details? you mean ,I just need to create a file and named it as .env config; and then put stuff like:DB_HOST=<address of your MySQL server>..... in it and save it? [David Losada, Ushahidi] DB_HOST would need to be just “localhost"
[David Losada, Ushahidi] DB_USER could be “root"
[David Losada, Ushahidi] what name did you give to the database? 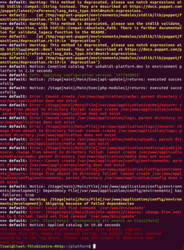 in the .env config ,which was put inside the "platform"
[David Losada, Ushahidi] still same error? [David Losada, Ushahidi] mm it’s a bit strange ..
[David Losada, Ushahidi] or is a formatting artefact in our chat? I'm running the progress "Installing with Vagrant"
I met a error when I command "vagrant provision"
Does anyone can help me to fix this? thanks a lot! ==> default: Some index files failed to download. They have been ignored, or old ones used instead. ==> default: You might want to run 'apt-get -f install' to correct these. ==> default: Unmet dependencies. Try using -f.
[David Losada, Ushahidi] sanqian, for some reason it looks like it's not picking up the file ..
[David Losada, Ushahidi] what’s the output of stat .env ? How can I get the output of stat.env? it just show an error "-bash: syntax error near unexpected token `('"
[David Losada, Ushahidi] willis, what did you run? can you copy your screen from the point when you did “vagrant ssh” ? 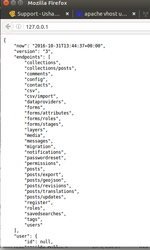 [David Losada, Ushahidi] sanqian, I’d check the full path of where you put your .env file . Where did you put it in the filesystem? [David Losada, Ushahidi] sanqian, I see, and are you using the terminal to run bin/update ? how can I put it in? [David Losada, Ushahidi] what’s the output? after those three commands, I should log out vm and command "vagrand provision" again? [David Losada, Ushahidi] does "ls -la /platform” show your .env file? [David Losada, Ushahidi] sanqian, let’s just move it to the right place then.. “mv /platform/.env /home/stephanie/platform/.env"
[David Losada, Ushahidi] willis.. mm , I guess try to vagrant ssh again and run “sudo apt-get install -f"
then get back run again "vagrant provision"? It seems can`t be moved? 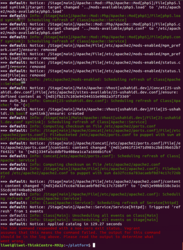 [David Losada, Ushahidi] willis, after you vagrant ssh, can you successfully run "apt-cache showpkg apache2” ? [David Losada, Ushahidi] do you see something like "2.4.7-1ubuntu4.13 “ in the output? [David Losada, Ushahidi] well, run “sudo apt-get install apache2"
still in the vm right? [David Losada, Ushahidi] still “ libapache2-mod-php5 : Depends: apache2 (>= 2.4) but it is not installed “ too? after I create the file in the right place ,and I found there is a file named .env.testing,should I delete it? should I just copy the code :BACKEND_URL=http://myapi.server/ to where? ok ,I got that. And all I should do is to add this line :BACKEND_URL=http://myapi.server/ to .env file I have created? [David Losada, Ushahidi] not quite, the installation process you are following consists of setting up 2 different virtual host web servers . Each of those virtual hosts will be working from a different url, one for the backend API services, another for serving the frontend files to the browser. The BACKEND_URL is inserted into the frontend files when building them, and is used by the browser to contact the backend API services when you access the website. [David Losada, Ushahidi] willis, I’m afraid there must be some oversight with the permissions.. try to comment this line in the vagrantfile ( https://github.com/ushahidi/platform/blob/develop/Vagrantfile#L7 ) restart the vm and finish running that “apt-get install -f"
[David Losada, Ushahidi] then undo the change in the vagrantfile before continuing with “vagrant provision"
ok so I think "apt-get install -f" is running successfully now. then I follow your instruction to undo the change and then run "vagrant provision"
sorry those comments are too long I only copy the last part. [David Losada, Ushahidi] did you uncomment that vagrantfile line and restart the vm? [David Losada, Ushahidi] mm if the line was uncommented, those files should be there .. you should see bin, application etc when you log into the vm and run “ls/var/www"
[David Losada, Ushahidi] dear Nesp, in order to access data contained in a deployment, I’d recommend to choose one of both options: either accessing the database or using the APIs. In general, all the information should be accessible through the APIs and that's probably a cleaner approach. A Heroku server should be fine for accessing the API, but in any case, if you want to have your own server and don’t intend to make modifications to the code, we’d recommend the zipped release bundle. That will probably also be easier to install on Windows (since you won’t need to setup node.js to build the frontend application). Make sure you are using PHP 5.5 or 5.6. Hope this helps! 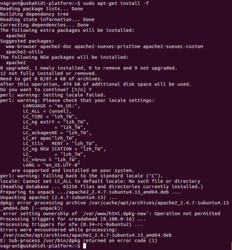 I am trying to install the platform release in a Ubuntu in a Virtual machine for now. In case I will not manage I will try with XAMPP. [David Losada, Ushahidi] willis , sorry I omitted a space between “ls” and “/var/www"
build the second virtual would achieve that function right? [David Losada, Ushahidi] willis, the other files should be there if Vagrant is properly syncing the files. Try an extra vm reboot for good measure, and check the logs carefully for something about synced files. And that one I have finished is the backend vhost right? How can I build the front one? Thank you so much ,helped a lot. so I run "vagrant reload"
and I can see those files now! should i still need to run provision again? those two confused me a lot, Are they mean the two vhost? but I am receiving the problems above. [Arturo Quintana, Ushahidi] Hello there! [Arturo Quintana, Ushahidi] I am using Ushahidi, and I am trying to update the platform.